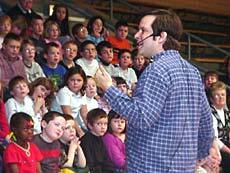 [FEB. 2, 2002] There was a new voice this week at Washington-Monroe elementary school. It traveled around from class to class, encouraging and strengthening the voices of the children. And it belonged to a man known as the "Fox." Brian “Fox” Ellis is a professional storyteller and teacher. Hailing from Peoria, he travels all over the country telling his stories and teaching children to tell theirs. This week, thanks to grants from the Illinois Reading Council and the Illinois Arts Council, children at Washington-Monroe wrote stories about their own lives and then learned to tell them to others in entertaining and exciting ways. The lessons started on Monday with a personal performance for each of the third- and fourth-grade classes. Ellis told the children both personal and historical narratives and gave them examples that he could refer to later of what it is to tell a fascinating story. Then the children worked on ways to collect stories, both from interviews and from their own past. Each child was asked to choose a memory of their own and write a story from it. They worked the rest of the week learning to edit, rewrite, tell and retell their stories. In this last process, the retelling, Ellis took the children through the three aspects of good storytelling: voice, body and imagination. In Mrs. Singleton’s class, he started with a simple “ma, me, mi, mo, mu” vocalization, in which each vowel is held, warming up the voice. Then all the children read their stories at once, each concentrating on his own. They worked on making their voices loud and clear, using interesting sound effects and dialogue, and putting feeling into their every word. For “body,” Ellis worked with the children on putting action into their stories, both in the words and in their movement. First, they underlined all the verbs in their stories. Then he taught them to make those verbs more interesting. For example, instead of saying, “We went fishing,” Ellis told the process of pulling out the worm, sliding it onto the hook, throwing out the line and reeling it back in. He also had them include adverbs: quickly, happily, annoyingly. Once the children knew what the characters in their story were doing, they had to act that out. After a quick stretching (part yoga, part Hokey-Pokey), the children again read their stories to themselves, but this time they had to work on actions to go with their action-words. Many of the kids were a little shy at first, but eventually most of them jumped and danced and, in the case of one boy, ran in circles. During this telling, Ellis and Mrs. Singleton walked around and gave suggestions and encouragement. One very important piece of advice Ellis gave was that they must always remain standing, acting out sitting by crouching and lying down by leaning. In the final stage, imagination, Ellis told the children they must be in the story as they tell it. “Your story is a time machine.” The children told their stories one last time, trying to incorporate all three parts. Only this time, they told their stories to partners, who then had to give two pieces of encouragement. This final telling, however, was more than another practice; it was an audition. Each class produced three children who were to perform for others. One child from each class was chosen to tell their stories to parents and classmates at the school’s Family Night, which was Thursday. The other two students told their stories to the other classes involved in the program. [JAN. 30, 2002] Last year Chester-East Lincoln School began a program called Accelerated Reader, a computer-based reading motivation system currently used by more than 40,000 schools nationwide. The program has three goals: to dramatically improve student reading performance, as measured by standardized tests; to improve students’ critical-thinking skills; and to instill in students a lifelong love of reading. As part of the motivational component, students earn points for the books they read. Prizes such as stickers, pencils, and homework passes are awarded for points accumulated. In the primary grades a student’s picture is placed on the Wall of Fame when he or she has earned 20 points. As students continue to earn points, they achieve certification levels. Every 100 points designates a new level, and a star with the student’s name on it moves up on the "big" Accelerated Reader bulletin board. On Jan. 24 Chester-East recognized all students who have reached the Wall of Fame, 100, 200 and 300 points. The students recognized were Kara Gehlbach, Alia Moon, Craig Rohlfs and Jessica Florey at 400 points; Ruth Ohmart, Erin Frick and Greg Harmon at 500; Cody Davison at 700; Troy Tholan at 900; and, at 1,000, Alison Kessinger and Melissa Cunningham, who are in the picture with Rich Brauer, a candidate for state representative. In his remarks, Brauer stated that reading is a lifetime skill that should be practiced and encouraged. He congratulated Melissa and Alison for reading 77 books each and passing all their tests to earn their 1,000 points. The entire student body gave the girls a standing ovation. [JAN. 24, 2002] Heritage in Flight Museum of Lincoln participated in Midwest Central High School’s Career Day on Jan. 11. This is an annual event at the high school in Manito. Heritage in Flight Museum’s educational coordinator, Milt Underkoffler, was introduced as the presenter of "Careers in Aviation" to the 15 students who had expressed an interest in aviation careers. Career opportunities at commercial service airports, general aviation airports, commercial airlines, in corporate aviation and with aircraft manufacturers were discussed. The aviation roles of the Federal Aviation Administration and the National Aeronautics and Space Administration were also presented. The students were particularly interested in the job descriptions, the salaries associated with the various jobs and the schools that prepare high school graduates for the positions. The aviation career that most of the students were interested in was that of an airline pilot. The students were particularly interested in ways of meeting the requirements for commercial airline pilots. Most of the students were aware that some pilots working for major airlines as captains on jumbo jets make up to $260,000 a year after 20 years of service. Underkoffler pointed out that many colleges and universities have aviation programs that enable students to qualify for a job with major airlines when they receive their bachelor’s degree. The cost of the flight training is in addition to the regular tuition fees. This high cost is why the airlines have traditionally hired multi-engine military pilots when they have completed their military obligation. Underkoffler summed up the discussion by pointing out that the 30-minute presentation was just touching on the topics that will be covered in depth at the "Careers in Aviation" workshop hosted by Heritage in Flight Museum in Lincoln this summer. The workshop, made possible by a grant from the Illinois Department of Natural Resources, will be June 3-7 at the Logan County Airport. Representatives of various aviation employing agencies will give presentations during that week. Lincoln and area school counselors are recommending students for the summer program. Underkoffler suggested that interested students talk to their counselor about attending. The workshop is still open to new students. Underkoffler also described a Sunday afternoon program that consists of two-hour discussions on selected aviation topics. The Sunday afternoon sessions emphasize the principles used to produce heavier-than-air vehicle flight. The technological developments that resulted in changing the number of wings, the shape of the wings, the number and type of engines, the introduction of jet and rocket power are also considered. The topics covered so far are "Fundamentals of Aviation," "Flight to the Moon," and "Space Station and Space Shuttle." The February topic on Sunday the 3rd is "Propulsion Systems." While the Sunday program does not include flight training, planners hope to schedule students for introductory flights during the weekends before June. [JAN. 21, 2002] Students in Mrs. Boehme’s fifth-grade class at Northwest School recently had their last day of DARE. To begin the class, Sgt. Ken Greenslate once again asked students to tell him about their week. They told him about their Christmas presents, how they had just finished reading to a kindergarten class, and how Mrs. Boehme had received roses for her birthday the day before. Since it was the last day, Sgt. Greenslate led a review session to see how much the students remembered. They split up into three teams of four members each. The teams took turns answering questions about DARE, drugs, decision-making and conflict resolution. Questions ranged from "What does DARE stand for?" (Drug Abuse Resistance Education) to "Define ‘consequences’" (the result of an action) to "List the six steps to conflict resolution" (cool down, state the problem, talk it over, listen, find a solution through compromise, ask for help if needed). For each question a student answered, he or she received a pencil, pen, eraser, key chain, or other small but useful prize. Team 1 won by 16 points to 14 points for Team 2 and 10 points for Team 3. Every member of Team 1 received a DARE pencil bag. The most exciting time for the students, however, came after the game. Sgt. Greenslate had a drawing to see who in the class would get to take Darren, the large stuffed DARE lion, home with him or her. The girl who won him was very happy, even though this Darren was fresh out of the plastic and not the one the students had each been able to hold during lessons. [JAN. 9, 2002] The DARE program, though sometimes overlooked, is alive and vibrant in Logan County schools. Students in DARE learn about being responsible and about the dangers of drugs and alcohol. Through real-life stories and lessons, they learn that they do not have to give in to peer pressure. 1. Ask if this is a risk situation. A risk situation is one in which you have to take a chance on something. 2. What are the possible choices? Usually you have two basic choices: Do something or don’t do something. Often, the option of “telling a grown-up” is included as well. 3. What are the possible consequences of my choices? Take each choice and list the positive and negative consequences. 4. Pick the choice with the best result. Sometimes, however, this is not easy to determine, especially when friends are involved. 5. Talk to someone. If you have trouble choosing, talk to a teacher, parent, officer or other adult who can help you make your decision. Students then read stories from their DARE workbooks in which children were in different situations and had to make choices. For example, Subira was asked by some friends to bring her parents’ beer to a party. The students went through the steps and decided what Subira could do. 1. Ask if this is a risk situation. Subira would be taking a chance of getting caught if she stole her parents’ beer and brought it to the party. 2. What are the possible choices? Bring the beer or don’t. 3. What are the possible consequences of my choices? Positive consequence of bringing the beer: Friends would like her. Negative consequence of bringing the beer: Might get caught by her parents or another adult. Positive consequence of not bringing the beer: Not getting in trouble with her parents. Negative consequence of not bringing the beer: Friends might call her a scaredy-cat or worse. 5. Talk to someone. Subira could talk to her parents and tell them what her friends asked, or she could talk to her friends’ parents or a teacher. Sgt. Greenslate then taught the students about courage. Courage, he told them, is a muscle that must be worked and practiced. Every week, he brings with him a large stuffed lion named Darren, who sits with one student through the lesson. Darren, as a lion, is the symbol of courage. To remind the students to work their courage muscles, Sgt. Greenslate handed out small Darrens to each member of the class. He also gave them each a DARE CD case, to remind them to do something positive (like listen to music) whenever they feel bored, since boredom can lead to trouble. Students in Mrs. Boehme’s class enjoy their time with Sgt. Greenslate. He spends the beginning of each lesson letting all the students tell him about their weeks. Students are also encouraged to submit questions to the DARE box, which he answers at the end of each lesson. Even the new observer can tell that the students trust Sgt. Greenslate from their dialog with him. They feel able to ask questions freely, because they know he will not laugh at them (unless they are making a joke.) Although the students were a little bit wild, with the holidays so close, he controlled them and guided them, and they learned through having fun. [FEB. 11, 2002] Lincoln Community High School hosted the sectional speech tournament on Saturday, Feb. 9, and the local team placed fourth. "There is no doubt that our season has been extremely successful," said Ed Jodlowski. He and Carrie Schreiber coach the team. "At the beginning of the year we set the goal to send seven entries to state. Eight is a dream come true," he said. Stanton Schumacher, Jerrod Marten, Jamie Eckert, Collin Voyles, Adam Voyles, Amanda Perry, Katie Muck, Tom Swanson, Brady Gerdts and Brandon Davis — Fourth place in performance in the round. [FEB. 11, 2002] Fifty students from the Logan County area have been named on academic honor lists for the 2001 fall semester at Lincoln College. Area students on the Special Honors List include Kari Borowiak, Ashley Bowen, Jonathan Cook, Miles Craig, Heidi Graff, Trisha Kavelman, Kristofer Langellier, Angela Maestas, Lyndsey Pickering and Josh Twente, all of Lincoln; Nathan Dieckow of Atlanta; and Brittany Franklin and Kyle Pepperell of New Holland. To quality for the list, students must achieve a grade point average of 4.0 with a class load of at least 15 credit hours in the current semester. On the President’s List are Angela Couch, Matthew Kurtz, David Martin, Clinton Smith and Angela Smith, all of Lincoln; Larry Jones Jr. and Rebecca Ruben, both of Hartsburg; Tamar Lyons of Elkhart; and Harry McMillan of Mason City. To qualify for this list, students must achieve a grade point average of 3.75 through 3.99 with a class load of at least 15 credit hours in the current semester. On the Dean’s List are Beau Anderson, Angela Bossingham, Tim Christoffersen, Molly Donnelly, Christinna Dye, Stacey Fillmore, Steven Goodman Jr., Aaron Johnston, Max Letterly, Morgan Murphy, Elizabeth Pardo, Stephanie Savery, Anna Schmidt, Jason Searby, Kristina Snyder, Lindsey Spurling, Jennifer Story, Adam Wessbecher, Jermy White, Erin Wind and Kate Winters, all of Lincoln; Brad Aper and Vanessa Watson of Hartsburg; Nathan Buss, John Hoblit and Ashley Satterfield of Atlanta; Jennifer Tuttle of Emden; and Misty Virgil of Middletown. To qualify for this list, students must achieve a grade point average range of 3.25 through 3.74 with a class load of at least 15 credit hours in the current semester. [FEB. 8, 2002] Washington University has named junior Bailey Bassi to the Dean’s List for the 2001 fall semester. Inclusion on the Dean’s List requires completion of at least 14 units of graded work and a minimum grade point average of 3.5 (out of 4.0). Bassi is studying at the University of Sussex in Brighton, East Sussex, United Kingdom, this spring semester. She will return from Europe in June. Bassi is the daughter of Kathleen Bassi of Chicago and Dale and Susan Bassi of Lincoln. [FEB. 4, 2002] The Lincoln Community High School speech team placed first in the regional speech tournament at Chatham-Glenwood High School on Saturday, Feb. 2. "This weekend was a wonderful morale-booster for the entire team," said Carrie Schreiber, a coach for the group. "The hard work that they put in every day has paid off, and now they are ready to enter sectionals with a wonderful win." Sectional competition for the speech team will be at LCHS this coming weekend. "We invite everyone out to see how wonderful these students truly are," said coach Schreiber. [JAN. 28, 2002] "This tournament was a good warm-up for the sectional tournament," said Ed Jodlowski, a coach for the Lincoln Community High School speech team. Many of the teams competing this weekend were some of the same teams that LCHS will see at the sectional level. "We really appreciate all of the community support that we received for this tournament," he said. Team coaches Ed Jodlowski and Carrie Schreiber invite the public to an evening of speech performances on Thursday, Jan. 31, at 7 in the LCHS auditorium. [FEB. 8, 2002] AURORA — The Illinois Mathematics and Science Academy invites applications from students looking for an educational program that offers a wide variety of challenging honors-level courses in mathematics, science, the arts and humanities. In addition, the academy offers a wide variety of fine and performing arts clubs and organizations, as well as interscholastic sports. Illinois students enrolled in the equivalent of a ninth-grade program are eligible to apply. Admission is highly competitive. Located in Aurora, IMSA has an enrollment of 609 students representing all areas of the state. The application deadline for fall 2002 admission is March 1. Qualified Illinois students interested in attending the academy in the fall should begin the application process immediately. For more information about IMSA, write or call the Illinois Mathematics and Science Academy, Office of Admission, 1500 W. Sullivan Road, Aurora, IL 60506-1000, (630) 907-5027, or in Illinois, 1 (800) 500-IMSA, or visit the IMSA admissions website at http://www.imsa.edu. IMSA, which opened in 1986, is a learning enterprise that builds the capacity of students, teachers and policymakers to improve and transform mathematics and science teaching and learning. IMSA’s residential educational program serves Illinois students (grades 10-12) talented in mathematics and science; its professional development center serves schools, educational systems, teachers and students in Illinois and beyond. [FEB. 4, 2002] The Lincoln Junior High School band director, Chad Minier, is continuing the tradition of giving scholarships to band members who are interested in going to band camp. The junior high plans to send more than 15 students to band camp this year at the University of Illinois in Champaign and Southern Illinois University in Carbondale. Band camp gives students the opportunity to meet and perform with band students from all over the country. Participants have many rehearsals and classes throughout the day. College professors and college students direct ensembles and teach the junior high students. Band camp participants learn about music history, theory and even composition. The camps always end with a concert featuring all of the students. Students stay on campus in dorms during the band camp. Many students do not have the opportunity to go to camp. The camps are very expensive. Lincoln Junior High wants to give all band students the chance to have a challenging but fun experience in music. Band camps are not just work. Students are given the opportunity to attend concerts, go on picnics, swim at the campus beach, canoe on the campus lake, attend dances and participate in many other fun activities. The average cost of band camp is around $400. Last year the Lincoln Junior High band was able to award $200 scholarships to more than 10 students. Community members and generous businesses donated money to help band students have new and inspirational experiences in music. Lincoln Junior High will be accepting donations toward band camp scholarships throughout the school year. Donations can be dropped off at the school office, at 208 Broadway. Checks should be made out to Lincoln Junior High Band Boosters. [JAN. 26, 2002] Applications for the Dwight F. Zimmerman Scholarship, sponsored by the Abraham Lincoln Healthcare Foundation, are currently available. Applicants must be seniors graduating from Lincoln Community High School, Mount Pulaski High School, Olympia High School, Hartsburg-Emden High School, Delavan Community High School or Illini Central High School, or students currently attending Lincoln College. Applications are available in the guidance offices of the above-listed schools. Applications are to be submitted to the Abraham Lincoln Healthcare Foundation, 315 Eighth St., Lincoln, IL 62656. The deadline to submit an application for the Zimmerman scholarship is April 5. For more information, call the foundation office at (217) 732-2161, Ext. 405. 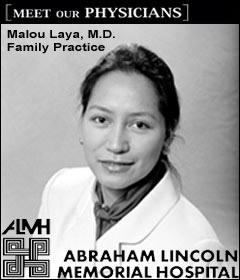 People wishing to contribute to the scholarship fund may send their contributions to the Abraham Lincoln Healthcare Foundation, 315 Eighth St., Lincoln, IL 62656. AURORA — The Illinois Mathematics and Science Academy has scheduled informational meetings for students, parents and community members to learn more about IMSA’s academic, residential and admission programs. Admission counselors will have the meetings throughout Illinois. Located in Aurora, IMSA is a learning enterprise which builds the capacity of students, teachers and policymakers to improve and transform mathematics and science teaching and learning. IMSA’s public residential educational program serves Illinois students (grades 10-12) talented in mathematics and science; its professional development center serves schools, educational systems, teachers and students in Illinois and beyond. IMSA, which opened in 1986, has graduated more than 2,400 students, with college placement rates of more than 99 percent. Illinois students enrolled in the equivalent of a ninth-grade program are eligible to apply. Admission is highly competitive. Tuition and most room and board expenses are provided by state funds. The application deadline is March 1, 2002. The academy offers advanced courses in mathematics, science, the arts and humanities with an emphasis on connections within and across the disciplines. Research is an important part of the academic program and enables students to work with faculty, scientists and scholars. The academy also offers many opportunities in fine and performing arts, 32 co-curricular activities and 18 interscholastic sports. Carterville, John A. Logan College, 700 Logan College Road, 1-31-02, 7 p.m.
Champaign, University of Illinois, Carle Forum Bldg., Fritz Conference Room, 611 W. Park St., 12-13-01, 6 p.m.
Chicago, DePaul University, 234 S. Wabash Ave., 1-15-02, 7 p.m.
Chicago, Beverly Branch Library, 2121 W. 95th St., 1-16-02, 7 p.m.
Chicago Heights, Prairie State College, 202 S. Halsted St., 2-13-02, 6:30 p.m.
Edwardsville, Edwardsville Middle School, 145 West St., 1-29-02, 7 p.m.
Effingham, Effingham Junior High, 600 S. Henrietta, 1-23-02, 7 p.m.
Grayslake College of Lake County, 19351 W. Washington St., 12-17-01, 6:30 p.m.
Normal, Chiddix Junior High School, 300 S. Walnut, 1-8-02, 7 p.m.
Oglesby, Illinois Valley Community College, 815 N. Orlando Smith Ave., 1-17-02, 7 p.m.
Palatine, Jane Addams Elementary School, 1020 Sayles Drive, 12-10-01, 7 p.m.
Peoria, Washington School, 3706 North Grand Blvd., 1-10-02, 6 p.m.
Rockford, U of I College of Medicine at Rockford, 1601 Parkview Ave., 1-24-02, 6:30 p.m.
Springfield, SIU School of Medicine, 801 N. Rutledge, 12-11-01, 6 p.m.
AURORA — The Illinois Mathematics and Science Academy will open its doors to prospective students and parents on the first Saturday of every month through May of 2002 to provide information about its programs. During the sessions, called "Saturday Live at IMSA," admissions counselors will be available from 10 a.m. to 2 p.m. to answer questions about the admissions process and provide information about IMSA’s academic and residential programs. Tours will also be available, as well as opportunities to speak with current IMSA students. Space is limited and advance reservations are required for the Saturday visits. Please call the IMSA Office of Admission at (630) 907-5027 or 1 (800) 500-IMSA (4672) to schedule your visit. Lunch tickets are available for $4 per person. Located in Aurora, IMSA is a learning enterprise that builds the capacity of students, teachers and policymakers to improve and transform mathematics and science teaching and learning. IMSA’s public residential educational program serves Illinois students (grades 10-12) talented in mathematics and science; its professional development center serves schools, educational systems, teachers and students in Illinois and beyond. Applications for the class of 2005, which will enroll next fall, are now being accepted. Talented Illinois students enrolled in the equivalent of a ninth-grade program are eligible for consideration. Tuition and most room and board expenses are provided by state funds. A written application must be completed and returned to IMSA, postmarked no later than March 1, 2002. Students should contact their high school guidance counselor or IMSA’s admission office at (630) 907-5027 or 1 (800) 500-IMSA to receive an application. Milk and condiments served with all meals. Students in grades three through eight may choose hot dog and bun or peanut butter and jelly sandwich in place of main entrée.